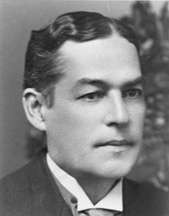 OWEN, Robert Latham, a Senator from Oklahoma; born in Lynchburg, Campbell County, Va., February 2, 1856; attended private schools in Lynchburg, Va., and Baltimore, Md. ; graduated from Washington and Lee University, Lexington, Va., 1877; moved to Salina, Indian Territory, and taught school among the Cherokee Indians; studied law; admitted to the bar in 1880 and commenced practice; federal Indian agent for the Five Civilized Tribes 1885-1889; member of the Democratic National Committee 1892-1896; organized the First National Bank of Muskogee in 1890 and was its president for ten years; upon the admission of Oklahoma as a State into the Union in 1907 was elected as a Democrat to the United States Senate for the term ending March 3, 1913; reelected in 1912 and 1918 and served from December 11, 1907, to March 3, 1925; declined to be a candidate for renomination in 1924; chairman, Committee on Indian Depredations (Sixty-second Congress), Committee on the Mississippi River and Its Tributaries (Sixty-second Congress), Committee on Pacific Railroads (Sixty-second Congress), Committee on Banking and Currency (Sixty-third through Sixty-fifth Congresses), Committee on the Five Civilized Tribes (Sixty-sixth Congress); resumed the practice of law in Washington, D.C.; organized and served as chairman of the National Popular Government League from 1913 until his death in Washington, D.C., July 19, 1947; interment in Spring Hill Cemetery, Lynchburg, Va. Dictionary of American Biography; Brown, Kenny. A Progressive From Oklahoma: Senator Robert Latham Owen, Jr. Chronicles of Oklahoma 62 (Fall 1984): 232-65; Keso, Edward. The Senatorial Career of Robert Latham Owen. Gardenvale, Canada: Garden City Press, 1938.